The Duke of Sussex has been working on the mental health series with Oprah for months as a co-creator and it’s set to launch in 2020. Record sales of services like Apple Music and iCloud helped offset 15% fall in iPhone sales. The technology show opens its doors on Tuesday. CEO Tim Cook blamed the slump on a slowing economy in China, where Apple has also faced competition from Huawei and Xiaomi. Apple has revealed its takings are expected to be much lower than predicted during the run up to Christmas, as demand for iPhones wanes. TED Talks Daily was named the UK's most downloaded podcast, with Love Island: The Morning After the most downloaded new podcast. The tablet has been redesigned to be thinner and lighter but with a bigger screen. 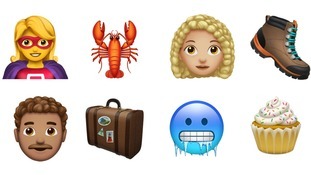 Apple users will soon be able to use new emoji from redheads to gender-neutral characters.